Martin Cornelisz YSSELSTEYN (1634 – 1705) was Alex’s 10th Grandfather; one of 2,048 in this generation of the Shaw line. Martin Cornelisz Ysselsteyn was born in 1634 in Ysselsteyn, Utrecht, Netherlands. His parents were Cornelisse Van YSSELSTEYN and [__?__]. He married Mayke Cornelise BARNAVELT in 1659 in Holland. They emigrated to New York in 1675/76. He was one of the first settlers of Schenectady; after residing here about six years he sold his farms and removed to Claverack, NY. He and Mayke made a joint will on 12 Jan 1676/77 when they were both then living in Claverack. Martin died in 1705 in Claverack, Columbia, New York. Mayke Cornelise Barnavelt (Maeycke Cornelis) was born in 1640 in Barneveld, Barneveld, Gelderland, Netherlands. Her parents were Cornelius Van BARNAVELT and Adraen Inges Van Der JACHT. Alternatively, her name was Zarrevelt. Mayke died in 1699 in Claverack, Columbia, New York. Descendents have changed the Ysselsteyn name to many different forms: Esselstyn, Yasel, Yazel, Yazell, Yazel, Yeasell, Yeasel, Yeazel, Yeazell and Yeazle. The Ysselsteyn family lived in Claverack, Columbia, New York. 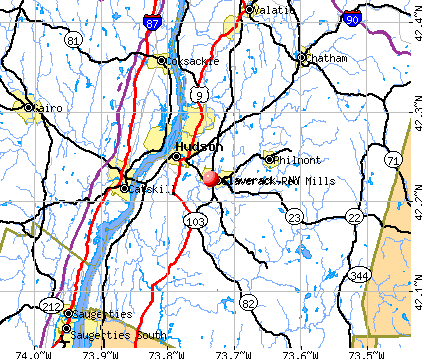 The town was formed in 1778 from the older “District of Claverack.” The town name is a corruption for the Dutch word for “Clover Fields” or “Clover Reach”. In 1782, the town lost some of its land to the new Town of Hillsdale. The town was reduced again in 1785 to form the City of Hudson. In 1779 Washington Seminary was founded in the town by the local Dutch Reformed pastor. Prominent former students at the school include U.S. President Martin Van Buren. In the nineteenth century the school was renamed in Claverack College, and it closed in 1902. Martin Cornelisz was one of the first settlers of Schenectady; after residing here about six years he sold his farms and removed to Claverack. His residence was upon his hindmost farm near the site of Mr. John D. Campbell’s house in Rotterdam. When first encountered by Europeans, the area that is now Schenectady was the land of the Mohawk nation of the Iroquois Confederacy. When Dutch settlers arrived in the Hudson Valley in the 17th century, the Mohawk called the settlement at Fort Orange (present day Albany, NY) “Schau-naugh-ta-da”, meaning “over the pine plains.” Eventually, this word entered the lexicon of the Dutch settlers, but the meaning was reversed, and the name referred to the bend in the Mohawk River where the city lies today. Schenectady was first settled by Europeans in 1661 when the area was part of the Dutch colony of New Netherland. Settlement was led by Arent van Curler, a prominent figure in the colony who had emigrated from Nijkerk in the Netherlands, after purchase from the Mohawk Nation. Additional land was purchased from the Mohawks in 1670 and 1672. In 1664 the English seized the Dutch colony and renamed it New York. Twenty years later (1684) Governor Thomas Dongan granted letters patent for Schenectady to five trustees. 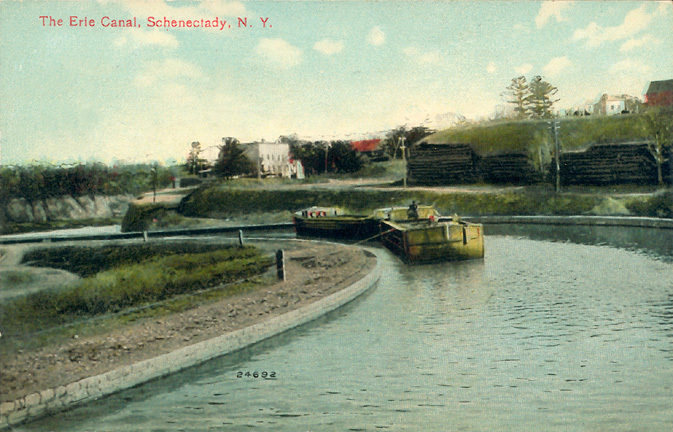 The Erie Canal crosses their Schenectady farm. In its passage across the bouwland was made over a series of dove gats or dead holes containing dead water, once doubtless the ancient bed of an arm of the river. One of these dove gats (called “Maritje’s Gat”) near the junction of the Prince town and river roads, of great breadth and depth, was enclosed by the two banks of the canal and called “Navarino Bay.”—M’M. Marten Cornelise Van Ysselsteyn removed to Claverack, in what is now Columbia County, New York. He was a resident of that place in January, 1677 when he made his will, but it is not certain whether he removed thence immediately after the sale of his Schenectady property. Several of his children were born at Claverack. In 1687 “Martinus Cornelissen Van Elsensteyn” was a sponsor at the baptism of one of his grandchildren, as we learn from the register of the old Dutch Reformed Church at Kingston. The original homestead which he occupied at Claverack has been continuously held by male descendants, bearing his surname, to the present time , or for seven or eight generations, and is now owned by Mr. Everett J. Esselstyn, lawyer, of New York City. Upon this estate is the only family graveyard, where members of the family found sepulcher for several generations, and it is believed that in this private cemetery lie the bones of the founder of this family in America, together with those of his good “vrouw,” Mayke or Maria Cornelise.. In their joint-will, executed “in the year after the birth of our Lord and Saviour Jesus Christus, 1676/, on the 12th day of the month of January,” they are described as “the worshipful Marten Cornelissen born in the Town of Ysselsteyn, and his wife, Maekcke Cornelis, born at Zarrevelt, living both on the Claverrack. * The Poenties kil crosses the river road on the west side of the old Van Ens place and is usually dry now at that point, the water having been diverted into Willem Teller’s killetje, which also crosses the river road about a quarter of a mile east of the Poenties kil. All these streams have failed of water of late years, though this kil comes from the sand.—M’M. Jannetie’s husband Hendrick Cornelisse van den Bogaert was born in 1656 in Hypick, Vianen, Holland. His parents were Cornelius Corneliszn Bogaert and Dirkje Pieterse Colymans. After Jannetie died, he married 15 Sep 1703 in Marnletown, Kings, New York, to Ruth Waldron b. 10 May 1657 in New Amsterdam; d. 1707 in New Harlem, New York. Hendrick died 9 May 1716 in Marbletown, Ulster, New York. Jannetie and Hendrick’s marriage record calls him a young unmarried man from Hypick, in the District of Vianen (Province of Utrecht, Holland), then residing at Kingston, N. Y. The birthplace of the bride is not given in the marriage record, but she is described as a young unmarried woman then “residing at the Klaverrack.” The first publication of their marriage banns occurred November 16, 1679, and they were given a certificate to be married at Albany. Three of their children were baptized at Kingston: Marten, October 3, 1686; Rebecca, April 4, 1697; and Rachel, May 4, 1701. Cornelis’ wife Cornelia van Vredenburg was born14 Dec 1667 in New York, New York. Her parents were Willem Isaacsen Van Vredenburgh and Apollonia Barents Kool. Her grandparents were Barent Jacobsen KOOL and Marretje Leenderts DeGRAUW. Cornelia died in 1711 in Claverack, Rensselaer, New York. The first publication of the banns being on the 23d of February, 1685 (old style). He is described as a young unmarried man, ” of Albanien “—which probably refers to his birth-place—” residing at the ClaverRack” at the time of his marriage, while his bride is described as a young unmarried woman “of N. Jorck, residing in Kingston.” In a deed referred to above, he is spoken of as “Cornelis Martense, eldest son and heir of Marten Cornelis Van Isselstyn, deceased, of Claverack.” He resided at the latter place on the Van Ysselsteyn homestead, and was prominent in the organization of the Dutch Reformed Church of Claverack, in 1727, and in the erection of its edifice, being the member of the Building Committee who took active charge of the affair. The present church building [in 1908] stands on the original site. His death occurred about the close of the year 1748, as is indicated by the fact that his will, dated June 21, 1740, was proved January 16, 1748/49. He had the following children: William; Bataah, baptized at Kingston, August 7, 1687, her paternal grandfather, “Martinus Cornelissen Van Elsensteyn,” being a sponsor, as was Appolonia Van Vredenburgh, her maternal grandmother, no doubt; Tobias, baptized at Albany, August 3, 1690; Isaac, at Kingston, January 1, 1696; Johannes, at Kingston, November 6, 1698; Jacobus, at Kingston, May 26, 1701; Abraham, at Albany, January 8, 1704; and David, at Albany, October 28, 1705. Oeertje’s husband Jacob Bruyn was born in 1645 in Norway. Jacob died about 1684 in Ulster, New York. Oeertje and Jacob had a son, Jan, baptized at Kingston, October 6, 1678. She and her first husband were sponsors, November 26, 1682, at the baptism of their niece, Gertrude, daughter of Johannes Smeddes and Machtel Van Ysselsteyn. Jacobus and was then residing at Kingston, as was his bride. He was the youngest son of Glande de la Mater, ancestor of the family of that name in America. Gertrude Van Ysselsteyn had, by her second husband, the following children, baptized at Kingston: Glandi, January 28, 1692; Isaac, June 3, 1694; Martha, November 8, 1696; Jacobus, May 18, 1699; Maarten, May 4, 1701; Bata, December 24, 1703; Hester, August 11, 1706; and Jannetje, April 1, 1711. 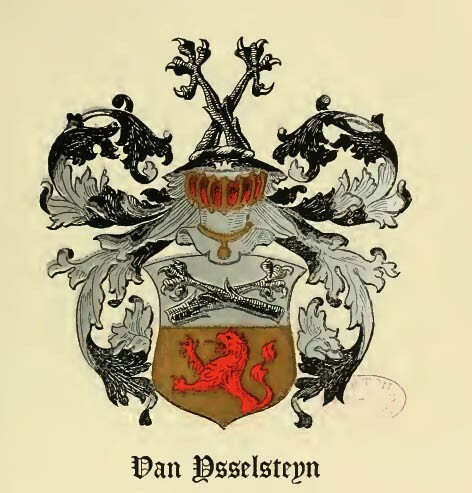 Pons Van Ysselsteyn, a sponsor at the baptism at Kingston, October 6, 1678, of Jan, son of Jacob Bruyn and Gertrude Ysselsteyn. This is the only reference to him known to the writer. Here his name appears as “Pons Ysselstein,” while “Willemtie Willems”—perhaps his wife—was a witness at the same time. Jacobus’ wife Cathalyntje van Deusen was born1677 in Claverack, New York. Her parents were Teuwis Abrahamsen Van Deursen and Helena Roberts. Cathalyntje died in 1798. Cathalyntje is described on her marriage record as a young unmarried woman, born in Claverack and residing there. Van Ysselsteyn is described as a young unmarried man, “born in Claveraack, and residing here “—i. e., in Kingston. He removed to New York City, and eventually to Amboy, N. J., and is the ancestor of the branch of the family which flourished in that colony prior to the Revolution. Among his children were the following: Marten, baptized at Kingston, August 11, 1700; Matheus, baptized at New York, October 16, 1715; Isaac; Helena, baptized at New York, March 28, 1703; and Bata, baptized at New York, December 26, 1705. Marritje’s husband Joris Aertsen Middag was born 24 Dec 1662 in Hykoop, Netherlands. His parents were Aert Teunissen Middag (1640 – 1687) and Breckje Hansen Bergen (1642 – ). Joris died 7 Dec 1730 in Marbletown, Ulster, New York. Marritje was born under the jurisdiction of Albany, according to the record of her marriage, which occurred April 22, 1696, while at the time of the latter event she was residing at Marbletown, as was also her husband, Joris (George) Midagh. She is described as a young unmarried woman, and Joris Middagh as a young unmarried man, “born at Hycoop, in Holland.” The antecedents of her husband are traced in the monographs on the families of Middagh, Bergen and de Rapalje, while an account of the children of Joris Middagh and Marritje Van Ysselsteyn will be found in connection with the Middagh Family, the line of descent of special interest to the present investigation being still further traced in connection with the families of Beatty, Haff and Crall. ‘Albany Deeds, Vol II., p. 542. The Indian name for this tract of land was corrupted into Schenectady. *” A History of The Schenectady Patent in the Dutch and English Times; being Contributions toward a History of the Lower Mohawk Valley,” by Prof. Jonathan Pearson, A. M., and others. Edited by J. W. MacMurray, A. M., U. S. A., Albany, N. Y., 1883, p. 13. For Van Curler’s letter see Albany Records, Vol. XXI., p. 137. This entry was posted in 12th Generation, Immigrant - Continent, Line - Shaw, Pioneer and tagged Schenectady Pioneer, The Erie Canal crosses Martin's Schenectady Farm. Bookmark the permalink.